Former British Prime Minister Tony Blair spoke with Chicago Tonight during a quick stop in Chicago on Wednesday to participate in an event with the Illinois Holocaust Museum and to announce receiving an award from the Abraham Lincoln Presidential Library Foundation. Blair talked about his impression of President Donald Trump, arguing that he supports current Prime Minister Theresa May having a close diplomatic relationship with him. Blair’s visit to Chicago comes as the U.K. struggles with the aftermath of the Brexit referendum vote in 2016. He has been outspoken on his opposition to Brexit, and has said in the past that he believes there is a “50-50” chance it won’t go forward. May has been negotiating the terms of Britain’s exit from the European Union, and has reportedly favored an approach that keeps a lot of the trade benefits that the country enjoyed while being a part of the EU. But EU leaders are likely to not accept those conditions. Blair says that once the wider British public catches on to the final terms of a Brexit deal, they aren’t going to like what they see. Blair says that although there is no legal precedent for another referendum like the one in 2016, there will have to be an alternate path forward if the British Parliament doesn’t approve a final deal. 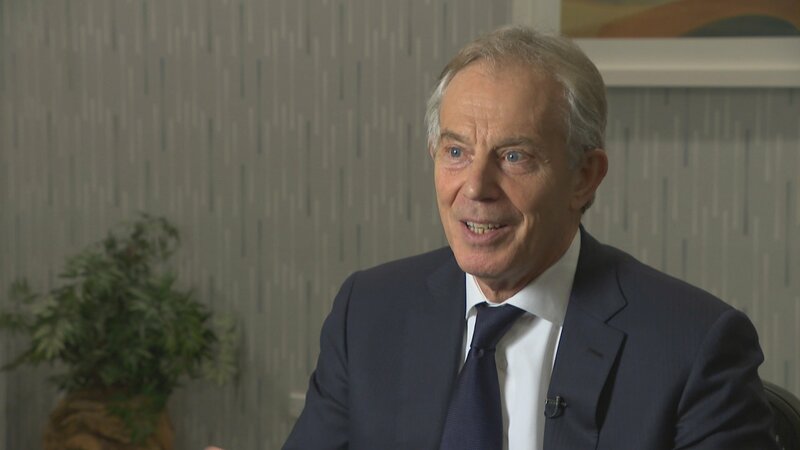 Video: Watch our unedited, 11-minute interview with Tony Blair. Blair served as prime minister from 1997 to 2007 and has led the Tony Blair Institute for Global Change since leaving office. He was criticized in his country for his close alliance with former President George W. Bush, and his support of the Iraq War. Blair has always played up the “special relationship” between the two countries, and says that it is even more important now in the face of Russian interference in western elections and the rise of China as a global power over the next several decades. He says that he believes the strain of nationalism and populism that undergirds Brexit and other political movements throughout Europe are a reaction to the anxieties that globalization produces, and that the world will continue to become more integrated. Governments, he says, have to be more sensitive to the implications of globalization on immigration and trade to keep the nationalist movement from becoming more sustained. Blair will return to Chicago on April 24 to formally accept the Lincoln Leadership Prize from the Abraham Lincoln Presidential Library Foundation, an honor he says is “one of the esteemed prizes” because of the legacy of the 16th U.S. president. Feb. 28: We speak with the former secretary of state and Patricia Harrison, the president and CEO of the Corporation for Public Broadcasting, about the hard work of reminding America of its shared creed. Feb. 7: The Canadian prime minister spoke candidly at the University of Chicago on Wednesday, addressing trade tensions between both countries, as well as his vision of gender equality. Oct. 30, 2017: At a book signing in Winnetka, the former Democratic presidential candidate was asked for her response to Robert Mueller’s investigation. “I have a great chapter about Russia in here,” she said, holding up her book.